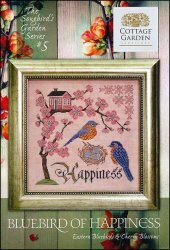 Songbird Garden Series 5: Bluebird Of Happiness [C6341] - $9.00 : Yarn Tree, Your wholesale source for cross stitch supplies. Cross stitch pattern from Cottage Garden Samplings. With it's petals shining light pink, a large, beautiful, cherry blossom tree stands with a small pink cottage on one of the branches. Standing watch near the nest full of eggs, sits two beautiful bluebirds. This is "Bluebird of Happiness." Stitch count 159w x 159h.